In the past I have shied away from Reddit under the blithe assumption that there was nothing there worth paying attention to. A few months back, during my research into various lifting routines, I discovered a blogger who recommended the routines listed on the Fitness subreddit’s wiki. Intrigued, I did my own exploration and found their list to be, in fact, quite good. Thus began my slow and careful perusal of what else Reddit has to offer. What I’ve discovered is that one does have to do a lot of filtering on Reddit, but one will hit gold every so often, and those hits are valuable enough to make the endeavor worthwhile overall. Further investigation yielded the PrintSF subreddit, and one nugget of gold it yielded was Locus Magazine, an SF industry journal, which maintains something I’ve always wanted access to: a full list of all the SF that’s coming out in the near future spanning all major and minor publishers. Finally, I have a single and complete list that I can search for intriguing new reads. Based on my perusal of this new source, here’s what I’m planning to read over the next three months. I initially raised my eyebrow at this one, as the blurb for Anders’s previous novel, All the Birds in the Sky, didn’t particularly catch my attention when it came out a few years back. I read through this book’s blurb and it feels like it’s worth a shot. I feel as though the idea of the tidally-locked planet has been done before, but it seems like there’s a good chance of the characters and their society being interesting. The blurb makes this novel sound like one of those “casually weird” experiences. The fantastic characters are trying to fit into their realistic setting. I generally like that kind of stuff, especially with themes of friendship and family woven in, as the blurb suggests. This is the kind of SF I would have only caught before if I’d happened upon it in my local bookstore. At one point, I had a copy of Alif the Unseen checked out from the library, but I never got around to it. Reading the description of The Bird King only makes me want to go revisit that novel all the more. The subject matter is even more compelling after my foray into the Classics, as one of my side jaunts from that was into the history of the Byzantine Empire and medieval Europe. I find I’m not often drawn to short story collections, but the description of this one sounded delightful. I’m a big fan of works that weave disparate themes and motifs together into something cohesive, such as Cloud Atlas, and that’s exactly what this sounds like. Okay, I admit it. I’m a sucker for disaster stories. Name a corny, disaster-themed B-movie and I’ve probably seen it. Reading the blurb for this book, my hope is that it transcends typical B-movie fare and does something really interesting with the characters and their plight. I also love the idea of a “rogue black hole.” That’s definitely a new one. I admit, there is a definite “YA love story” vibe coming from the blurb, but I chose to proceed with this one on the basis of the mystery around the world it sets up. This has the potential to go really, really wrong, but I’m hoping that it doesn’t. The blurb does plant the seeds of enough interesting ideas that I’m willing to give it a shot. This is my current read. It was released this January, and I started it a few days ago. So far, so good. You’ll see a review of this book from me sometime in the near future. I discovered this from one of newest Locus edition’s “Best of 2018” sections. I liked what the reviewer there had to say, and upon reading the novel’s blurb, I found myself laughing out loud, in a good way. I can’t wait to see how Miller depicts the “orcamancer.” Definitely looking forward to this one. A novel about humans and aliens struggling to successfully recognize one another’s sentience? Sign me up. This one I didn’t actually get from Locus; it’s the book of the month over at the PrintSF subreddit. I’ve maintained for some time now that nothing interesting is happening in mainstream SF these days. 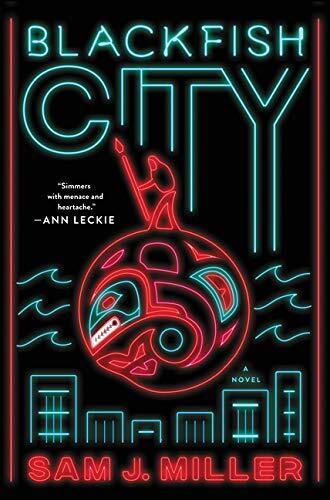 This interpretation has been largely based on my experience with Seattle SF writing groups and those individuals’ generally limited reading interests. Based on my brief exposure to the full range of published books, my view of the field appears to have been too narrow. Clearly, I have a lot of reading and learning to do.